Thiru Vignarajah, a second-year student at Harvard Law School (HLS), was elected earlier this month as the 118th president of the Harvard Law Review. Vignarajah was selected Feb. 11 from among 10 candidates based on his academic performance and writing skills. He has served on the Review as an editor since August. Former Review President Daniel B. Kirschner ’99, a third-year student at HLS, praised Vignarajah for his excellent papers—including a book review of Murder and the Reasonable Man: Passion and Fear in the Criminal Courtroom by George Washington University Law School Professor Cynthia Lee—and the dedication he has shown to the organization. Vignarajah takes the helm of the Review as its leadership struggles to address a gender gap among editors on the Review. In November, The Crimson reported that the number of women on the Review has fallen to its lowest point in a decade. Only one quarter of the journal’s 84 editors are female, while women comprise about half of the student body at HLS. Vignarajah was born in Sri Lanka and immigrated to the United States with his family when he was three years old. He grew up in Baltimore and went on to study philosophy and political science at Yale. After graduating from college in 1998, he earned a master’s degree in medical ethics and law from King’s College, London. Prior to enrolling at HLS, Vignarajah worked for three years as a managing consultant for McKinsey & Company. He credits the support of his family for his success. Vignarajah said he didn’t make his decision to run for president until a couple of weeks before the deadline. 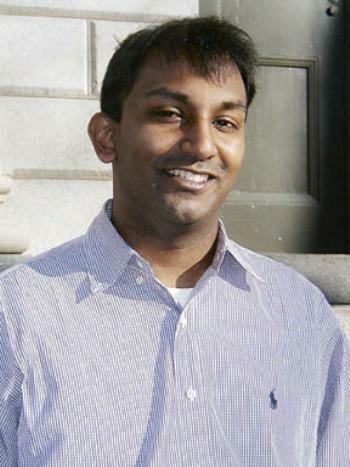 Vignarajah said he aims to foster a familial environment at the Gannett House, the journal’s headquarters on the HLS campus, and to select and edit articles for publication from the over 2,000 submitted each year that are intriguing to everyone from "practitioners to academics to students." “One of my jobs is to make sure that we publish really interesting legal scholarship that is at once diverse, in the sense that it appeals to lots of different segments of the legal community, but also groundbreaking,” he said. Founded in 1887 by future Supreme Court Justice Louis D. Brandeis, the Review is a prestigious publication with the largest circulation of any law journal in the world, according to the HLS website. This year’s volume features, among other works, a Supreme Court issue which includes articles by Boskey Professor of Law Lani Guinier ’71 on the 2003 University of Michigan affirmative action cases and a forward by Yale Law Professor Robert Post on how decisions by the Court from the past term reflect a “connection between culture and law,” according to Vignarajah. In addition, a special symposium issue commemorating the 50th anniversary of the Brown v. Board of Education decision will be published in March. “The ideas and pieces in our volume are as diverse as the editors on our Review and the authors from which we draw,” he said. “It’s an opportunity for [Vignarajah] to think about new and creative ways to engage the law school community and the legal community,” he said. —Staff writer Andrew C. Esensten can be reached at esenst@fas.harvard.edu.